Draft: 2'-6"; Broad Down: 4'-6"
TRAILER SAILER 32 is a maximum road sized boat capable of road cruising to destinations around the country. She is also a very capable cruiser when she arrives. She has self righting ability to 130 degrees which is impressive for a shallow draft boat. Construction is plywood and epoxy with strip planked radius chine. Her raised deck provides a roomy feel below. Her bilge keels and leeboards provide a clean interior cabin. There is an option for bilge boards worked into the interior arrangement in lieu of leeboards. There are options for sail rigs as well depending on the type of sailing planned by the owner. A hull kit is available for an easy start to construction. Purchase and Download Study Plans for the TRAILER SAILER 32 for $5.00 in PDF format (zipped file). 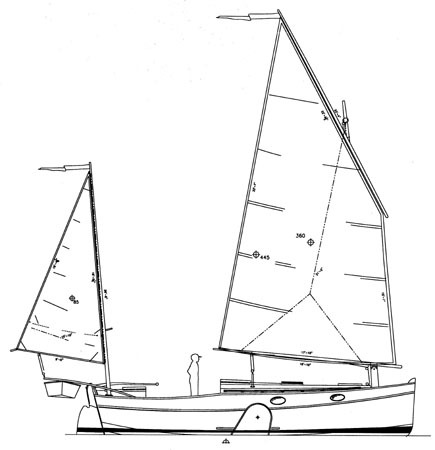 Purchase Construction Plans for the TRAILER SAILER 32 for $850.00 for delivery by US Postal Service.